While my DC knowledge is limited, I think I know this much: there have been two major DC relaunches in the past ten years: The New 52 and Rebirth (I hope I’m right), and during The New 52, Batgirl, at issue 35, underwent a transformation, making her much more hip and cool…now she wears cool yellow Doc Martins, takes selfies, and deals with being a young woman in Burnside (town outside of Gotham), love interests included. Rebirth continues this tradition, and the first Batgirl trade is just as fun as the old 52 Burnside Batgirl. This trade is six issues, but honestly, it should be five because the arc of just the five issues makes so much more sense. 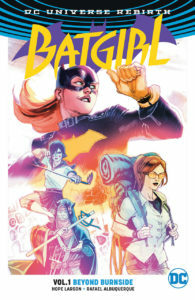 The first five issues deal with Barbara Gordon on vacation in Japan, but when stuff hits the fan, she finds herself on an action-packed journey across countries, and when all is said and done, it wraps nicely in five issues. The writing by Hope Larson is exemplary, but what I enjoyed the most about this trade is Rafael Albuquerque’s art; the close-ups bring out ridiculous expressions in the characters, especially Batgirl herself. I could see myself using this book in class when discussing characterization and its connection to fore, middle, background detail. 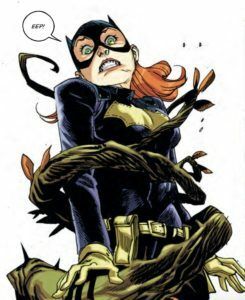 Not as gritty as Black Canary, and not as complex as The Flash trade from yesterday’s review, but this Batgirl has something about it that does a fine job separating it from the others. I’m three out of eleven DC titles in, and so far, they have all been great, and they have all had their own fingerprint.